Just a short 1.5 hour drive from historic Charleston SC, Myrtle Beach is one of the major centers of tourism in the United States because of the year-­round warm subtropical climate and extensive beaches! 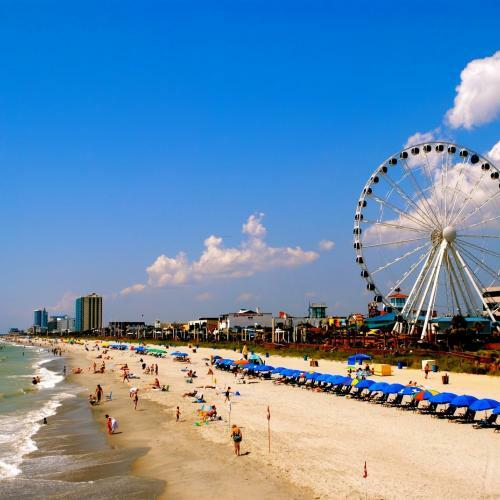 Myrtle Beach is also known for it’s art and culinary culture and offers a plethora of shopping and entertainment. Step up in your career and into Ashiatsu, come get barefoot with us in Myrtle Beach! Please take note: We are located on the south end of Myrtle Beach in the Surfside area. When looking for lodging, please be sure you map out the distance from your hotel to the training studio before you book a room. You can drive for 40 minutes, straight on the same highway and still be in Myrtle Beach. There are hundreds of hotels, here are just a few. It’s best to keep your search to Surfside, Garden City or the south end of Myrtle Beach, (NOT north of the airport) to cut down on daily travels. This place is right next door to the training studio, they are difficult to book with and not on the beach. If you are here without a car, it may be ideal to just walk here to and from class. Call them to book as there are several of these properties in Myrtle Beach. Holiday Inn Oceanfront at Surfside Beach 1601 North Ocean BLVD Surfside Beach SC 29575 843-­‐238-­‐5601 This location is beautiful, right on the beach and only 3.9 miles from the Ashiatsu Training Studio (about a 10 minute drive) but a little expensive at $150-­‐$250 per night depending on the time of year. It’s under $100/night after labor day.